Kathy and I lived in Fairbanks, Alaska for 30 years and camped in Denali Park frequently, usually at the Teklanika River. 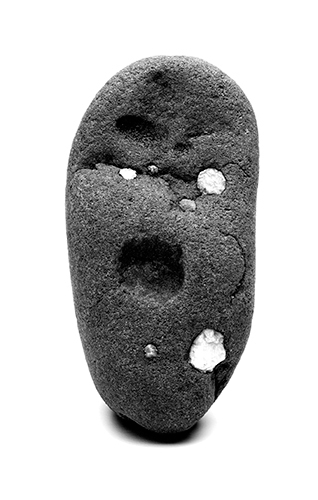 Years ago, while walking along the river, we spotted a stone that looked like a face and I made a picture of it. Only a few minutes later, there was another “stone face” and on it went, year after year. Once we got started, we couldn’t not see stone faces while walking along the Teklanika River. Remarkably, since the first Teklanika River stone face, we’ve walked along the Yukon, Tanana, Chena, Toklat, Chandelar, Hula Hula, Chilkat, Maclaren, Copper, Nenana, Chatanika and McNeil rivers in Alaska, to name a few, and ocean beaches at Homer, Seward, Haines, Kenai, Sitka, Kodiak and Fox Island, but no stone faces. We’ve found shorelines with all flat stones, round stones, big stones, little stones, even an unusually high percentage of heart-shaped stones on one beach, but no stone faces anywhere other than along the Teklanika. Coincidentally, the book and movie of the same same title, “Into The Wild,” about Chris McCandless’s sojourn into the Alaska wilderness only to lose his life from exposure and starvation, identifies the Teklanika River as the river he had crossed earlier on his way into the wild and again later as the raging river he could not get back across, resulting in him being stranded in the wilderness.